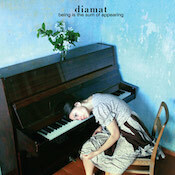 On their debut release, Being Is The Sum Of Appearing, Diamat work within the familiar framework of mixing melodic electronica and glitch. The trio of Attilio Bruzzone (Port-Royal), Andrea Zangrandi and Christos Garmpidakis (Dergar) turn out eight texture-rich tracks, expertly shifting tempos along the way and hitting the spot equally well whether fast or slow. While it’s not earth-shakingly new, it is solid, repeat-worthy listening. The quieter side of the equation runs heavy on emotion–melancholy, longing, and ache often peer out of the structures, and they’re quite beautiful. “Heliotrope,” which is one of the quieter pieces here, thrives on these kinds of sounds. After a two-minute vignette of light pads and a vocal sample immersed in a wash of white sound, the atmosphere shifts to let gentle pads and a softly bouncing sequencer line take the front. On a release that’s more about the higher BPMs, it’s a well-thought-out break in the flow. The glitch aspect is handled nicely, complex patterns underscored with the insistent dull thud of bass drum. If I had one off thing to say about this release, it’s that I felt like I could use quite a bit less of the thump. In places it works absolutely fine; but when I listen to “Zralocik,” for example, it feels obtrusive–I want to hear more of what’s going on beyond it. (My aged ears keep picking up a faint hint of New Order in the background.) For me, this album, which begins establishing its likability with the first few tracks, really hits its stride in the stretch beginning with the two parts of “Misunderstood,” “Shane Vendrell,” and “Painkillers.” The first slides in quietly, layering in elements, its base, repeating melody slowly rising up to take the lead. And then come the drums, big and potent and perfect, to take it in a fresh direction. Part Two slows the pace and settles into a lounge-like space…for a while. It’s a pleasure to listen to this gently ramp up–you can feel the switch coming on, and it’s a smooth transition. “Shane Vendrell” is where the straight-up club thump of the drum works for me. Here we’re getting a blend of textbook techno over ghostly vocals that chant like a mantra, all curling into a hypnotic swirl. “Painkillers” opens keeping a similar cadence, but slowly dissolves, letting its components fall away to reveal its underlying simple grace. Being Is The Sum Of Appearing is a pleasantly groovy little ride. Its path may take it through quite-familiar territory, but the landscape of the thing is worth paying attention to. I really like having this in a shuffle, where the thuds and the glitch are spread out and come as a more welcome arrival rather than more of the same. Check this out for sure.